Finally, in mid-July the time had arrived. After purchasing 4-wheelers in the spring, Grant and I had been patiently waiting for a free weekend in which to hit the New Brunswick trails. This was going to be Grant’s first ATV trip, so I wanted to show him a good mix of trails and logging roads en route to our campsite. Our destination was a site on the Cains River, known locally as the Italian Bridge. We discovered the site a few years ago on a canoe trip down the Cains. At that time it was unoccupied so we decided to squat for the night – it was too perfect to pass up. As it turned out, the site was for fishermen that had booked Upper Cains Crown Reserve fishing stretch. We resolved to return someday and fish. During discussions leading up to our 4-wheeling trip we debated going up, camping if the site was available, and going elsewhere if it wasn’t. However, we decided that we didn’t want to spend time and gas roaming around looking for an alternative should the need arise. Crown Reserve fishing is run on a lottery based-system. Each year anglers place their names in a draw for exclusive access to some of the province’s most sought after fishing spots. In the low season — when the fishing is poor — some weekends go undrawn. When this occurs anyone can book the stretch on a first come, first serve basis. As it turned out, we were in luck: our chosen stretch was unbooked, and just like that our 4-wheeling trip became a fishing trip. Our plan was to meet in Chipman on Friday and strike out from my parent’s house. 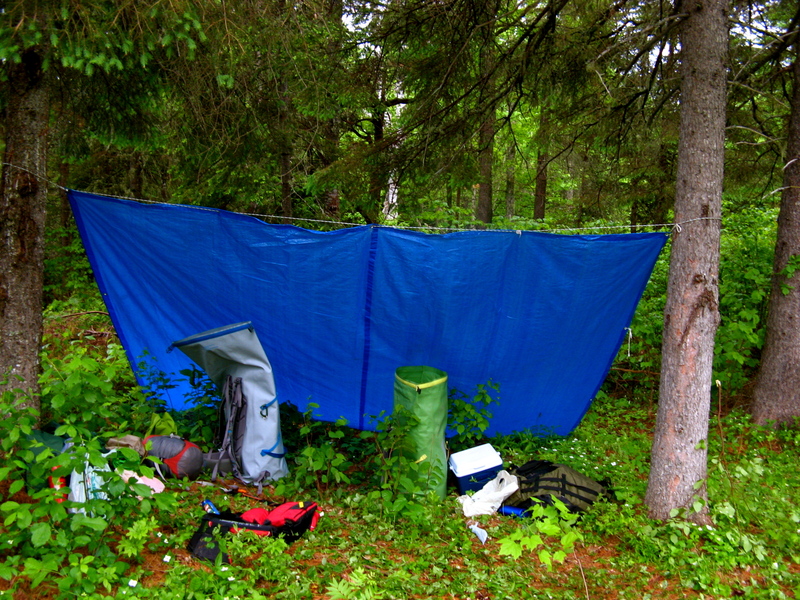 We arrived at the house around 4:00pm, secured our gear onto our quad racks, and hit the trail. In total, our route was around 60 km. 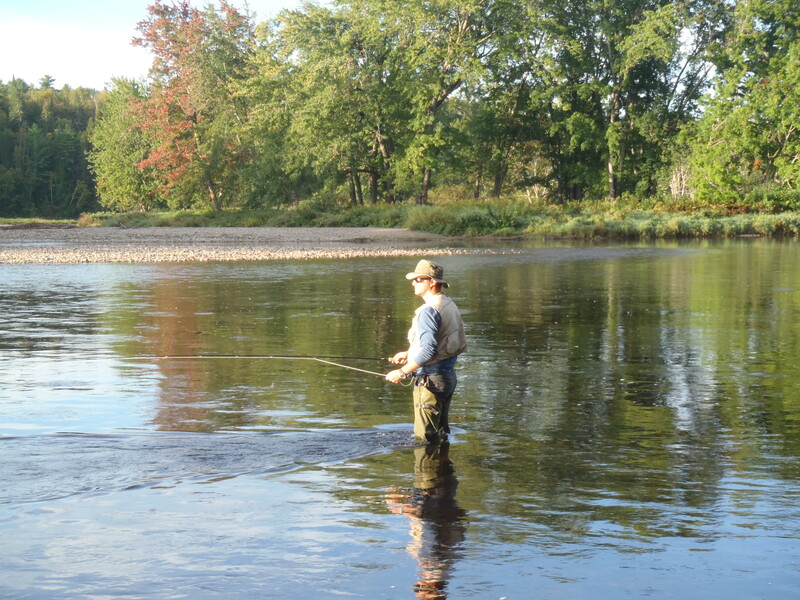 We hoped to arrive at the Cains River in time to set up camp and partake in an evening fish. We travelled down an old trail that connected North Forks to Gaspereau. Conditions were dry. On the Howard Lemon logging road the dust forced us to either drive side by side or 400 meters apart. We crossed the Gaspereau River at the Grand Lake SnoCruiser’s Snowmobile Shack. The trail system beyond the Gaspereau connected us to Mountain Brook Road and eventually Blue Rock. From Blue Rock we headed straight to the Italian Bridge –arriving at our site around 7:30pm. The Upper Cains Crown Reserve is a live release only stretch that encompasses over 10km of the river. Several tributaries drain into the river in this area — Gordon, Otter and Wildcat Brooks to name a few. In total there are 14 named pools and an untold number of fishable rips, not bad for $23/rod. With the temperature in the high 20’s, it was a warm evening. The water, however, was cool and deep, much deeper than the Gasperau. 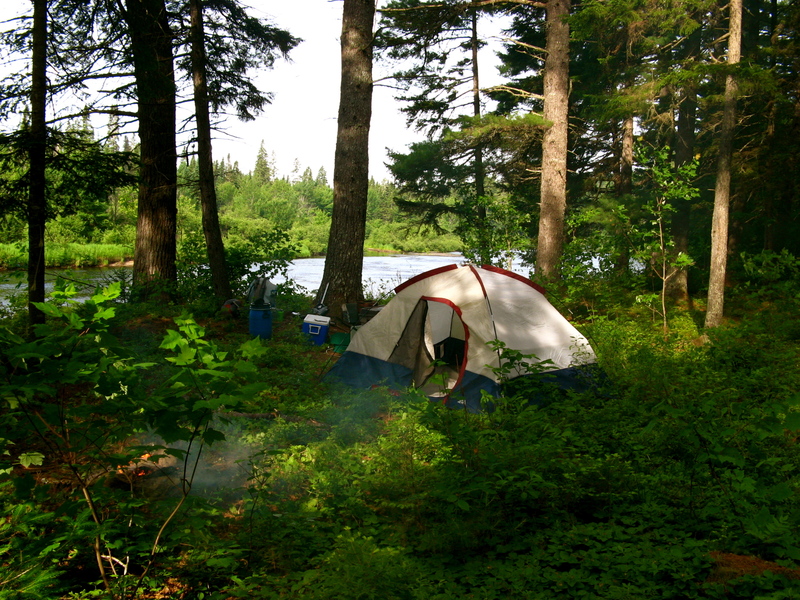 We scouted the four pools closest to our campsite — Salmon, Acadia Bridge, Pine, and an unnamed pool — and decided to fish only one for the night. After setting up camp we tied on our go-to flies and hit the water. Things were quiet at first, but after settling in the pool suddenly came to life. Fish began rising all around us. In a short period of time we probably landed a half dozen fish — a mix of good sized trout and chub. Unfortunately, just as quickly as it came on, the pool went silent. Conditions were serene as the sun was setting so the lack of action didn’t matter. 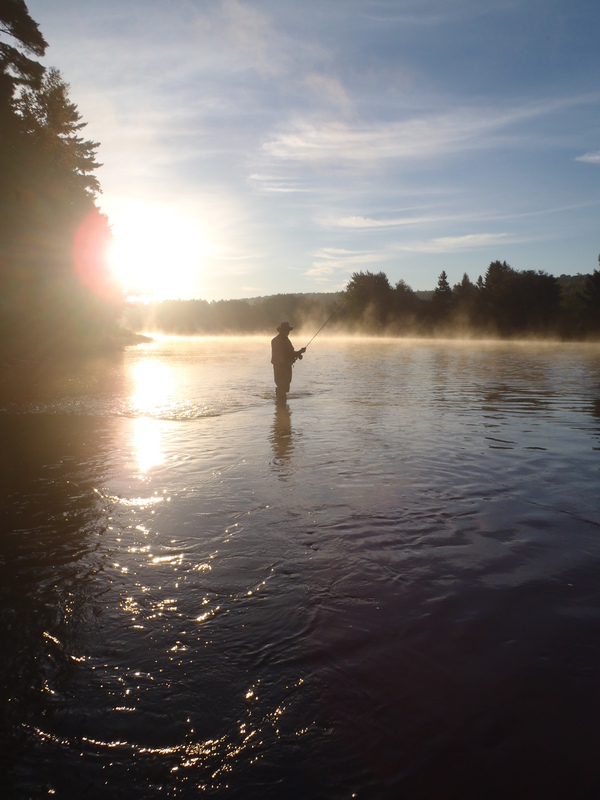 We were content to enjoy the tranquil sounds of the river and watch arced fly-lines travel through the air against a spruce backdrop illuminated by the setting sun. Back at the campsite, the mosquitos were relentless. Our smoky campfire offered some reprieve, but regardless the onslaught lasted until dark. After a busy day, we attacked our steaks and wine with the same vigor as the bugs did us. With heavy heads, we arose the next morning at the crack of 9:30am – well past peak fishing time! Dark grey clouds approached and thunder rolled in the distance, and, of course, our rain gear was packed deep into packs on the quads. The storm ended up being uneventful, it lasted just long enough to soak through my cheap rain suit. With low expectations, we made it to the river by 11:00am. Grant had good luck the previous evening so he offered up his hot spot to me for the morning session. He had been fishing with a nameless orange dry-fly, and had enticed a few nice trout to the surface. I opted to stick with the Olive Crystal Flash Wolly Bugger from the previous evening, mainly for convenience sake. 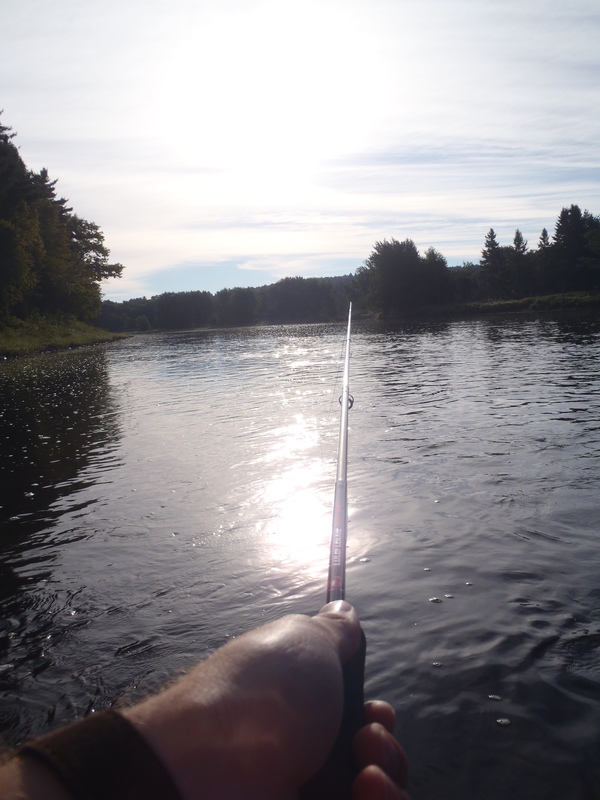 I was not having much luck, so I switched up my approach and began casting up river. This method allowed my fly to drift more freely through the center of the pool and resulted in a hook-up. A good fight ensued and I landed the first fish of the morning, a foot-long chub. Not really what we were looking for but good fun none the less. I released the chub and began to cast away upstream again. After no more fish, I was ready to relinquish the spot to Grant when suddenly I felt a small bump. I pulled the rod skyward hooking nothing but water. I rolled the line a short distance upstream again only to feel the same bump. This time my timing was on. SCREEEECH!!! My Orvis Battenkill II reel screamed as I was into a very nice fish. The fish swam straight to the bottom and made a run for it. In our limited experience we surmised this was the way a Salmon typically takes a fly, and, with the way my trout rod was bending I had little doubt. Grant ran back to the campsite to retrieve the camera. I did my very best to keep this fish hooked. 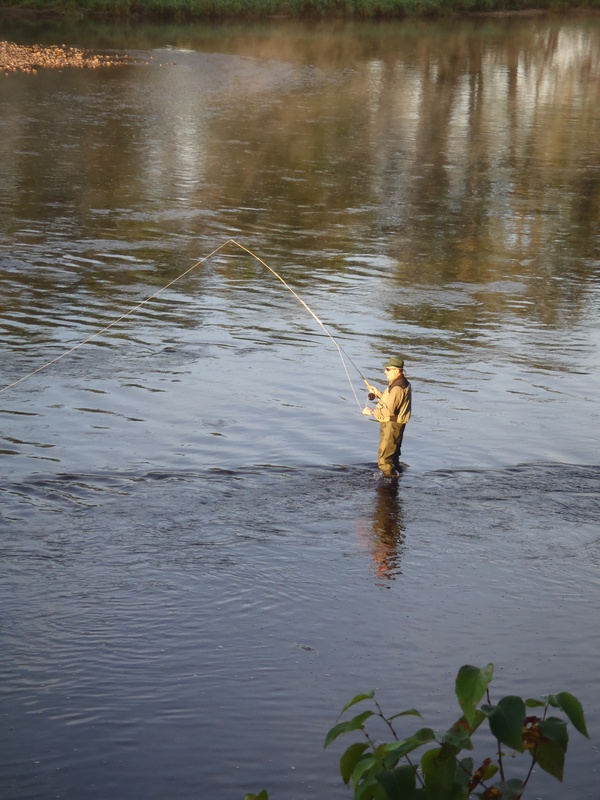 I followed him down along the bank through the pool keeping the rod tip skyward. I was only a few minutes into this battle but I could feel my forearm pulsing to maintain the resistance. This fish was still pulling line. I had to palm my reel to slow his progress. Grant returned out of breath but full of excitement — he wanted to land this fish as badly as I did. 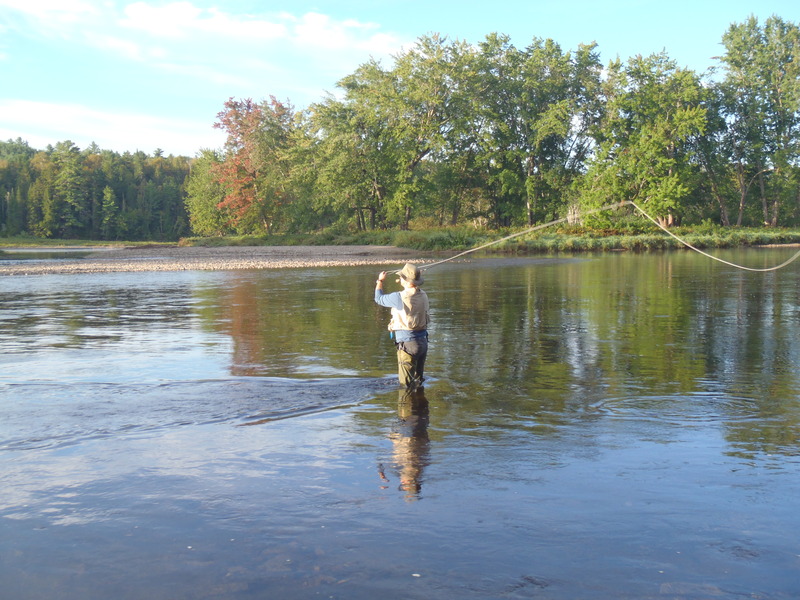 We coordinated an effort to land the fish on a small gravel bar along the bank. Our first attempt showed us that the fish was not a salmon, but rather a very large trout. 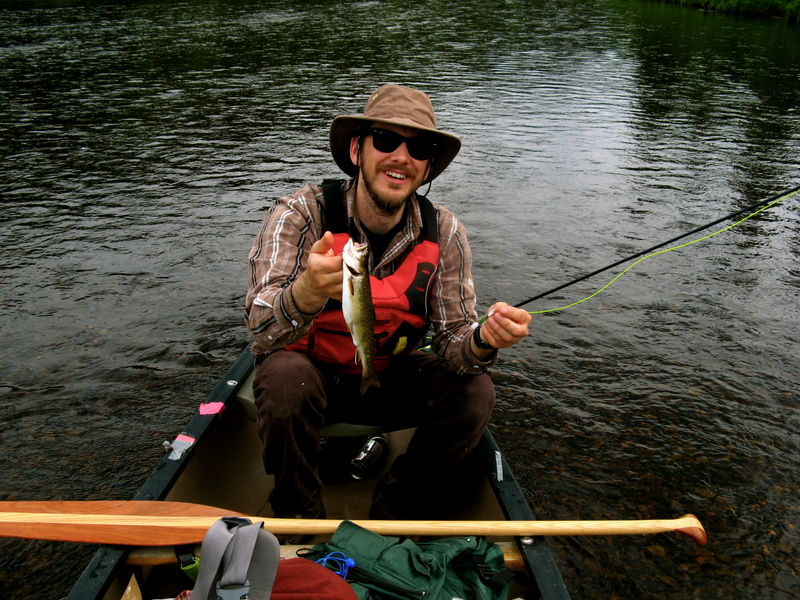 However, the fish – like most people — spooked at the sight of Grant and peeled more line off my reel. For us, the third time was a charm, and we successfully landed the largest brook trout I will probably ever catch. The trout measured in at 22inches in length. It had a girth similar to that of a football. I estimated that it would tip the scales at a minimum of 3.5lbs — but it was likely closer to a 4lb fish. After some photos I worked the fish back into the water to be caught another day. Grant caught a couple more trout, but I didn’t land another. …off to live another day. 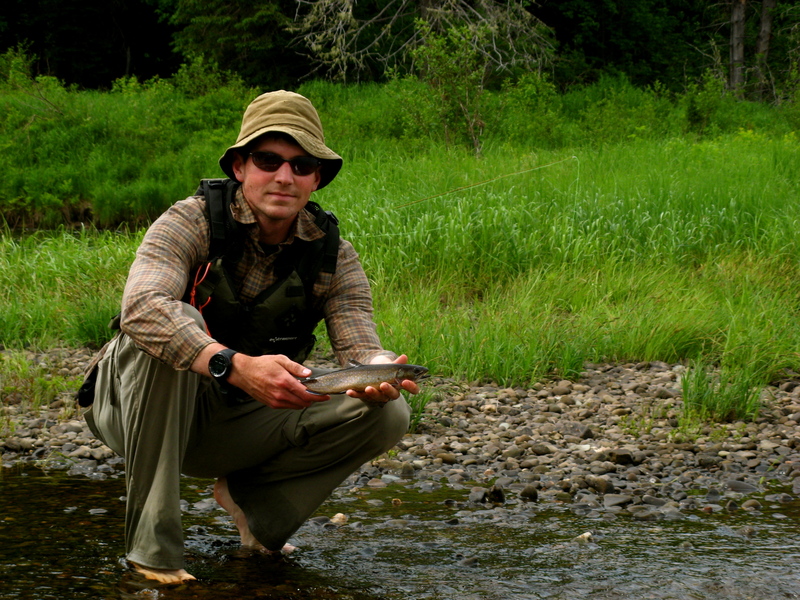 Grant displays another fine trout caught on the fly. Eventually we packed up our gear and headed home. That night I would attend my 10-year High School reunion and ironically, the only story I told was from earlier that day! 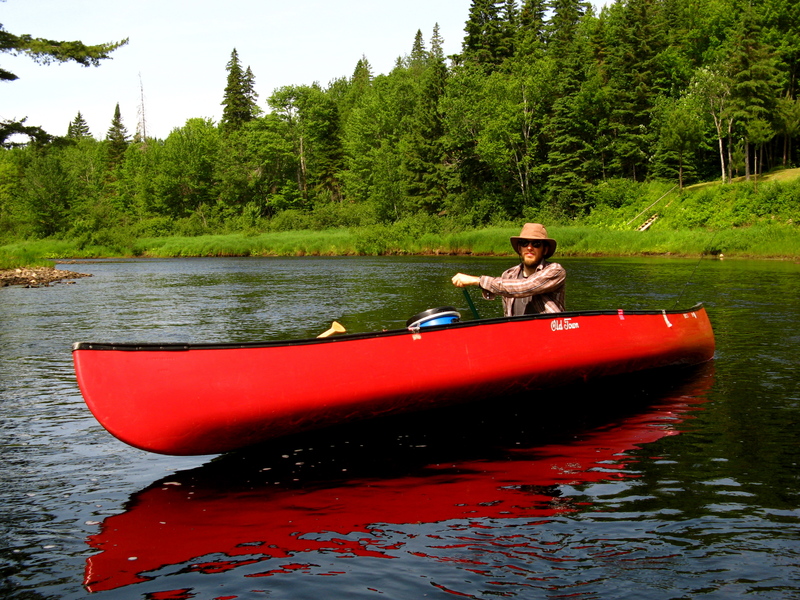 As June turned to July the water levels of New Brunswick’s rivers continued to drop – providing limited canoeing options. So, when my friend Randy and I were searching for places to head out on a two-day canoe trip, I suggested the majestic Cains River. Earlier in the month I had paddled the lower Cains, so to make things more interesting we decided that we’d paddle the often-ignored upper section. We thought access might be an issue, but after some local advice and extensive mapping we located an accessible put-in about 30-40 km above the 123 Highway bridge. On the hot and sunny morning of June 30th my truck – along with my Old Town Disco ’69 — rumbled up Randy’s steep gravel driveway in Gaspereau, N.B. Randy was in the yard preparing his Old Town Discovery 17’4”. For something different, we were both bringing our own boats. It was going to be my first overnight solo trip, and I was pretty excited. The Upper Cains is shallow with intermittent deep pools, and no real rapids — basically a perfect candidate for a canoeist’s first solo overnighter. Randy is also a certified canoe instructor, so I reasoned that if I was struggling I could – begrudgingly – ask him for a few pointers. Our shuttle driver was Roger, Randy’s big, burly, soon-to-be father in law. We loaded the boats into the bed of Roger’s 1990’s GMC pick-up – stacked on top of each other – and strapped them down tight. Our excessive strapping prompted Roger to note, “we ain’t gonna be doin’ a hundred mile an hour boys, she should hold.” After which we hit the road, promptly travelling 99 mph. The road to the put-in was rugged, and likely inaccessible by car. Thankfully, Roger’s truck weaved us through the patchy landscape without much trouble. The landbase in the area is mostly industrial. Fresh clear-cuts from harvesting resulted in unnatural, yet intriguing views of the forest interior. 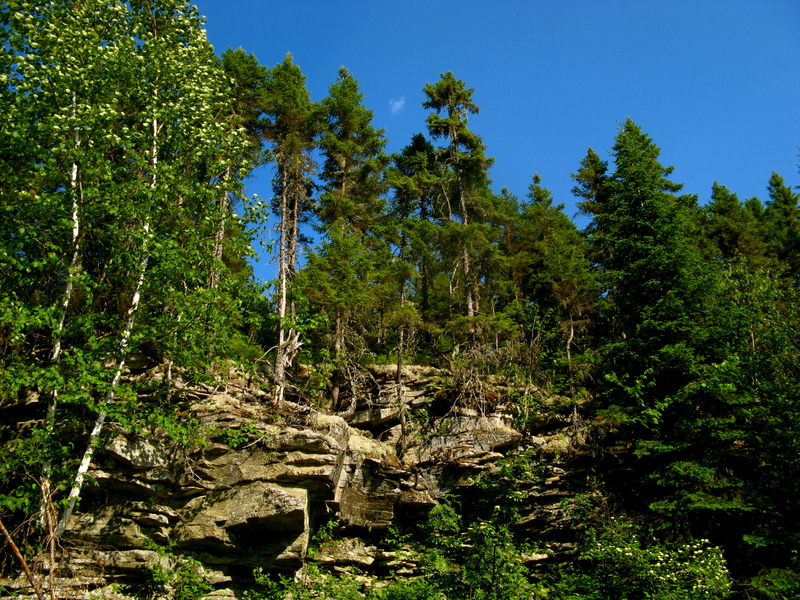 The understory of the spruce-fir forest appeared dark and barren. I wondered whether or not I would notice the cuts from the river — or would I be lured into imagining contiguous, untouched wilderness. 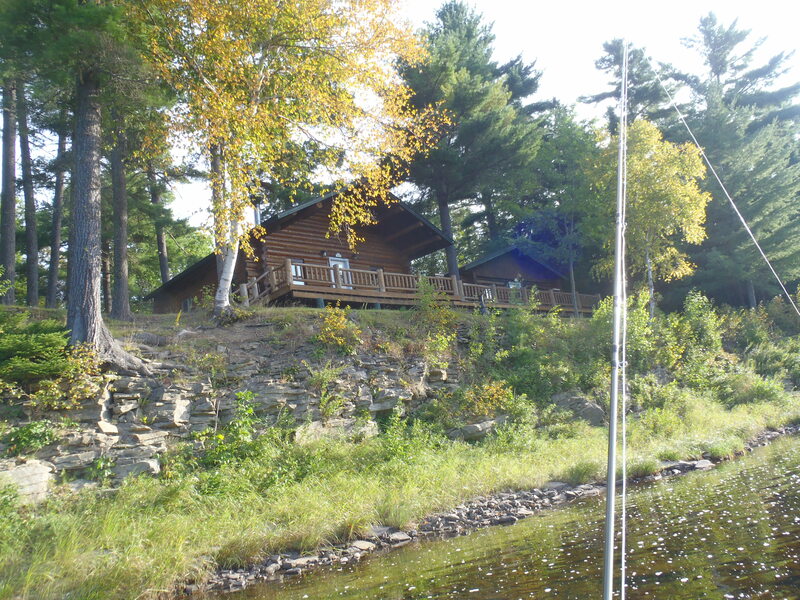 Regardless, the area is wild country — fishing camps serve as the only human habitation. The put-in was at a site where an old bridge used to be. The water was easily accessible via a gravel trail where four-wheelers cross the river. We bid our adieu to Roger and hit the water around 10:30 a.m. The temperature was already well above 20°C with expected highs of around 32°C — the forecast calling for sun all day. Thankfully we were both equipped with the finest headwear known to man, Tilley hats. 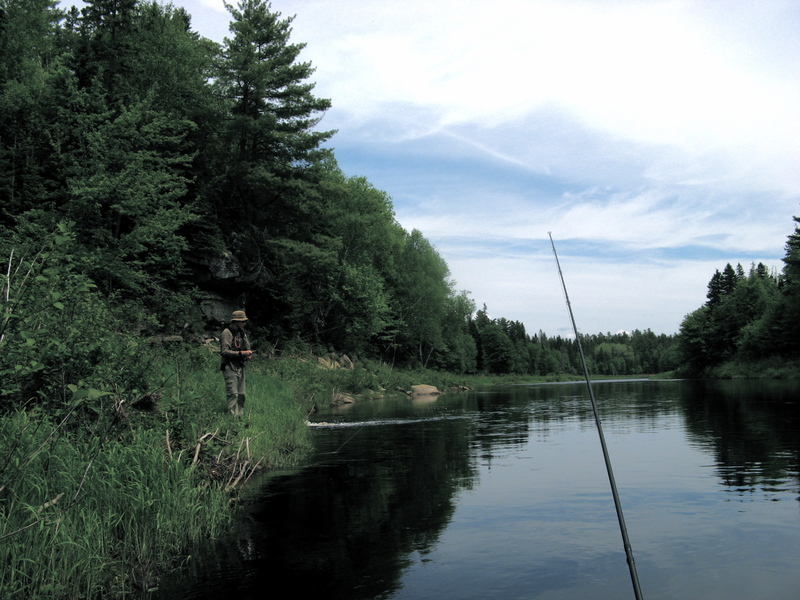 Roughly half of the trip was through crown reserve – no fishing — waters and the remainder was catch and release only. We fished the upper stretch before arriving at the no fishing area. The trout were taking on bombers. 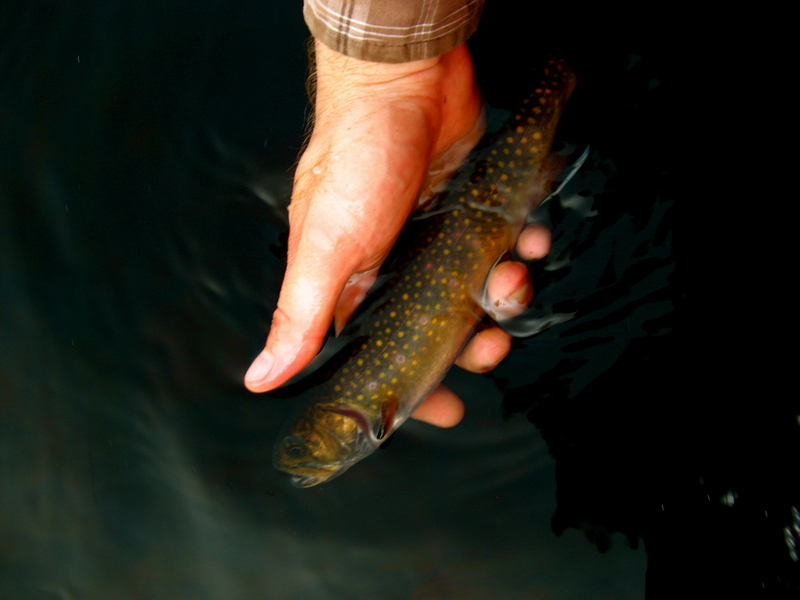 I landed a couple of beautiful 6-8” brook trout – with their signature vibrant blue and red speckles. After moving into the crown reserve zone, we put our rods away for the rest of the trip and just enjoyed the scenery and sunshine. 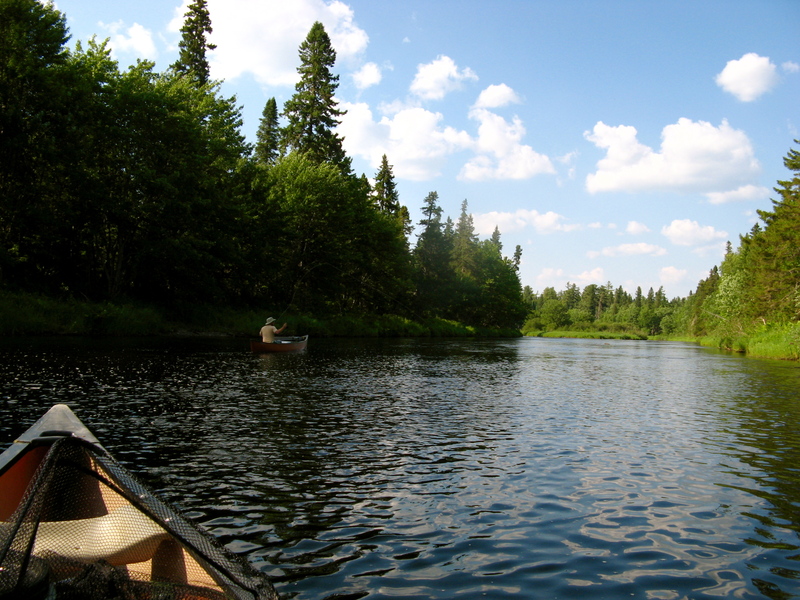 Canoeing conditions were fantastic — the water level in Blackville read 1.0. We drifted under the glaring sun along side shale cliffs and past sentinel white pines – seemingly deep in the Acadian forest. My only complaint was that I was sitting turned around in the bow seat. The seats in my boat are moulded plastic, so they’re a tad uncomfortable. I agreed, so we pulled our boats up on a nearby gravel point with some shade. In the hot sun, our beverage of choice was not doing us any favours in terms of hydration. I relaxed in the shade, staring up at the sky through the leaves of a silver maple tree and eventually dozed off. After about an hour Randy woke me up, “Hey GV, we should get going.” The shade break was exactly what we needed. We hit the water with a new-found sense of vigour. Eventually we reached what “had to be it.” It was everything we expected — shaded, flat, and covered with beautiful white pines. 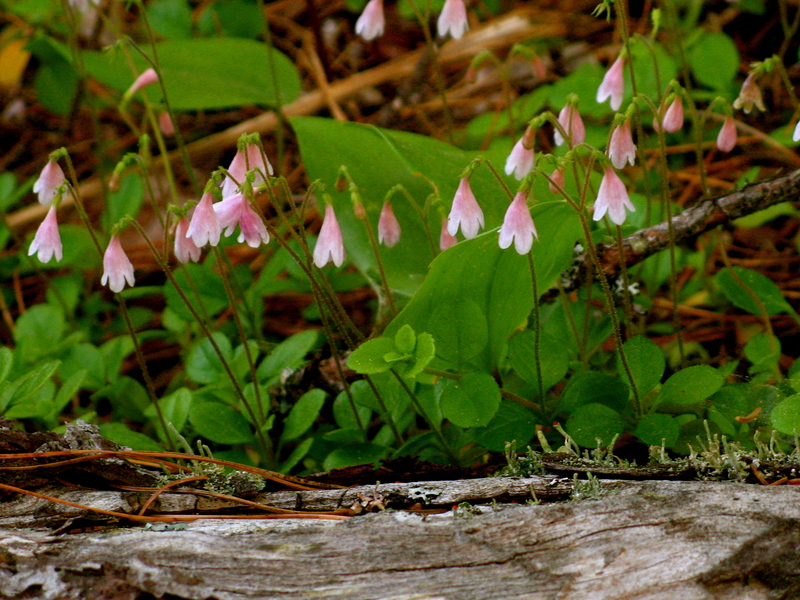 The twin flowers (Linnaea borealis) were in full bloom – they have a nice little pink blossom. The site appeared as though it hadn’t been used this year – most things were grown over. A bunch of old garbage was strewn about — why do people think that frying pans, pots, and beer cans will burn in a fire? We set up our tent and settled in for the night. After the bugs died down, we sat around our campfire under the starlit summer sky and enjoyed a nice steak with a couple beers. It doesn’t get much better than that. In the morning disaster struck. After a thorough search I asked, “Randy, where’s the pot so I can boil some water for coffee”. I was left without coffee until we could reach the Tim Horton’s in Minto, N.B. Parts of the river on the second day were striking, nice looking crown reserve fishing camps were situated on deep beautiful looking pools. Schools of large creek chub swam frantically away from us as we drifted over. I liked to imagine salmon and 4 lb trout lurked somewhere in the depths. Note the pool I’m paddling through. I spent most of the trip on my knees avoiding the moulded plastic seats. 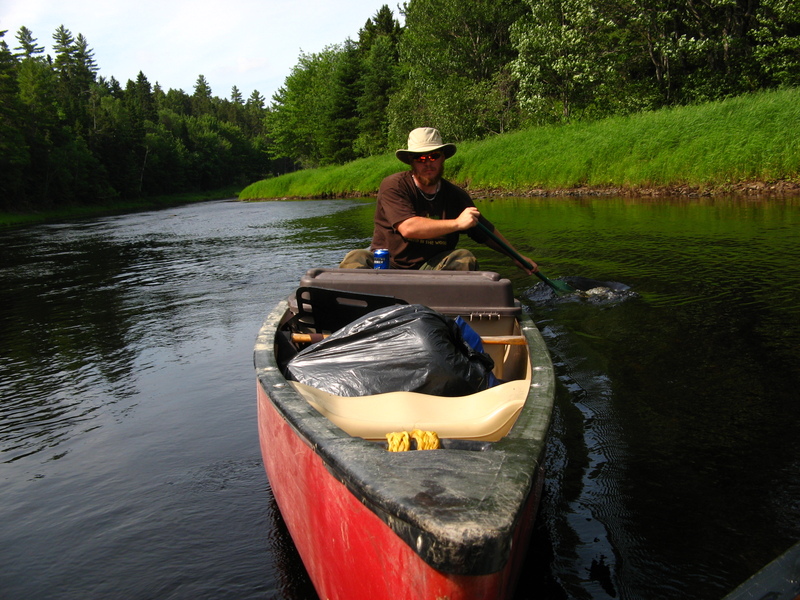 We jumped in my truck and headed back to Randy’s place on the Gaspereau River, another river for another day. As Grant mentioned I was back in New Brunswick last week for a few festivities leading up to the end of the world as I know it — my wedding this winter. 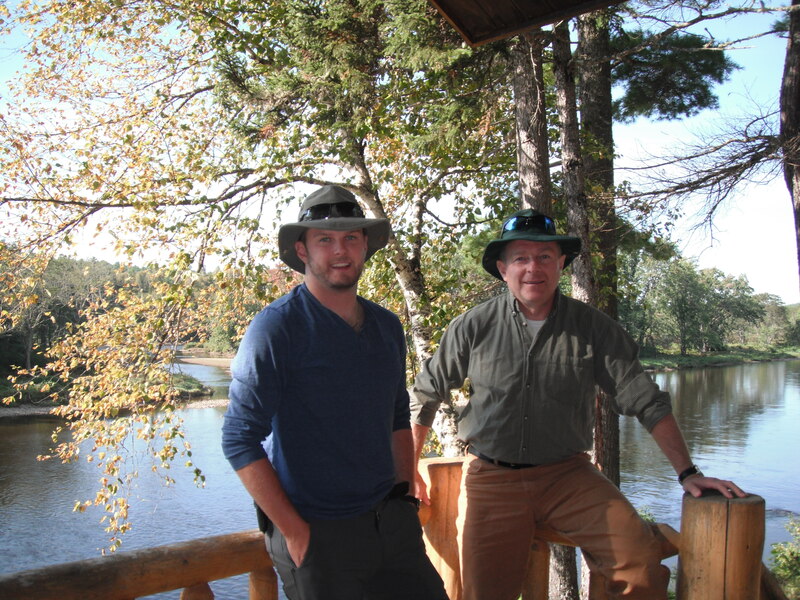 Prior to our St. Croix River run, I had scheduled a fly fishing trip with my father. Dad had won the trip in a draw at the New Brunswick Big Game Antler Show which was held in Chipman — our home town — this past spring. So, on Wednesday evening we found ourselves heading north on Route 123 towards Doaktown and the storied Miramichi River. We landed at the Betts-Kelly Lodge with instructions to unload ourselves into the Lower Cabin. We soon realized that we were alone on the Lodge grounds and decided to settle into some deck chairs. As we sat and admired the beauty of the mighty Miramichi River, we witnessed a doe and her fawn brave the currents and cross the river just above us. Just as a bald eagle swooped into its nest at the top of a large white pine directly across from us — possibly showing us where to fish in the morning? — we heard a vehicle approaching. Our host Keith made his way onto the deck as my father and I introduced ourselves. We could see that he was somewhat puzzled and then he said “I’m dumbfounded as to why you are here.” My father chuckled and explained they had spoke earlier last week to confirm the date, to which he responded, “Today is Wednesday! ?” He explained he was gearing up for the upcoming bear season and had lost all track of time. 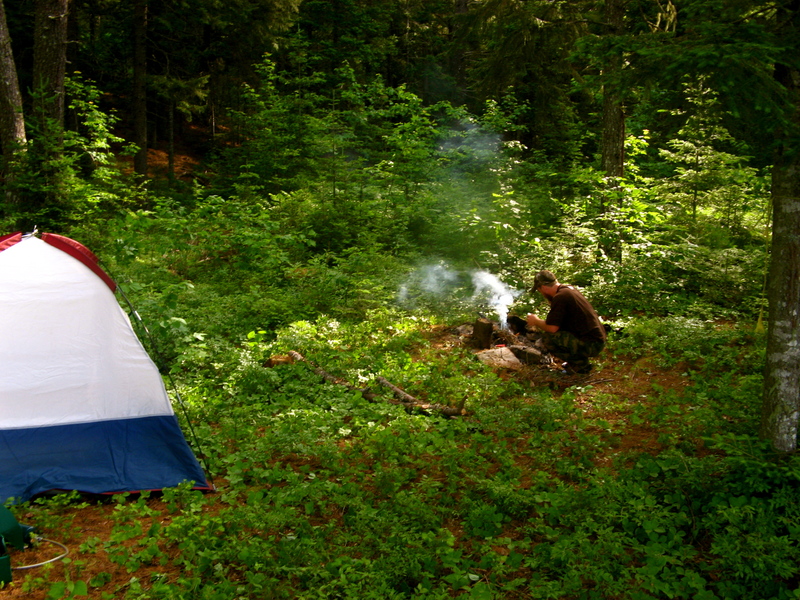 We assured him everything was in order at the camp, and that we were very low maintenance so he had nothing to worry about. After a few games of cribbage and a couple of New Brunswick’s finest cold ones, we retired to our beds with our alarms set for morning. We awoke before the sun — at 6:00 a.m. — and began preparing our fishing gear. Having traveled from Newfoundland, I opted not to bring my rod on the plane. Dad assured me that I had an old rod at home I had forgotten about. As I pulled it from the case I immediately noticed that the rod was on the light side for salmon. Sure enough it was a 5 weight. I also noticed that whoever had tied the leader and fly on last was a complete idiot — wait, who’s rod was this again? The floating line had been tied into a double overhand loop with the leader cow hitched onto it. Suffice to say it required some improvement. I sent dad on his way to the river and settled in at the lodge table to tie on a new leader and fly. I had read that a nail knot is great for joining leader to floating line but I had no idea how to tie one. Thankfully, I was able to access animatedknots.com to walk me through each step. After a couple tries I had leader joined to line like a professional, with limited experience. I used the improved clinch knot — that I learned on the Serpentine — to attach an Orange Bomber, and I was on my way to the river. The plan was to enjoy a few hours of fishing in our private pool and then return to the lodge for breakfast. The pool we were working was in the main part of the river. There was a ledge protruding from the left side of the river that created a nice eddy behind it. We were casting into the current and allowing the fly to drift into the edge of the eddy where we thought fish would hold up. Our guide confirmed that the rumours we had heard were true — it had been a bad year for fishing. As few as 12,000 salmon had returned to the river this year, down from 112,000 in 1990. After several hundred casts, we were starting to believe those numbers. Ever the optimists, my dad and I opted to switch over to smaller flies in hopes of enticing a trout. I fumbled through my fly box and came up with a fly that I had no idea what it was is called. A true amateur fly fisherman had told me to simply add the word ‘machine’ after stating the colour of the fly — making my selection a “Brown Feather Machine”. Within minutes of making the switch my father’s line went tight. Both of our hearts skipped a beat, we were into our first fish of the day! 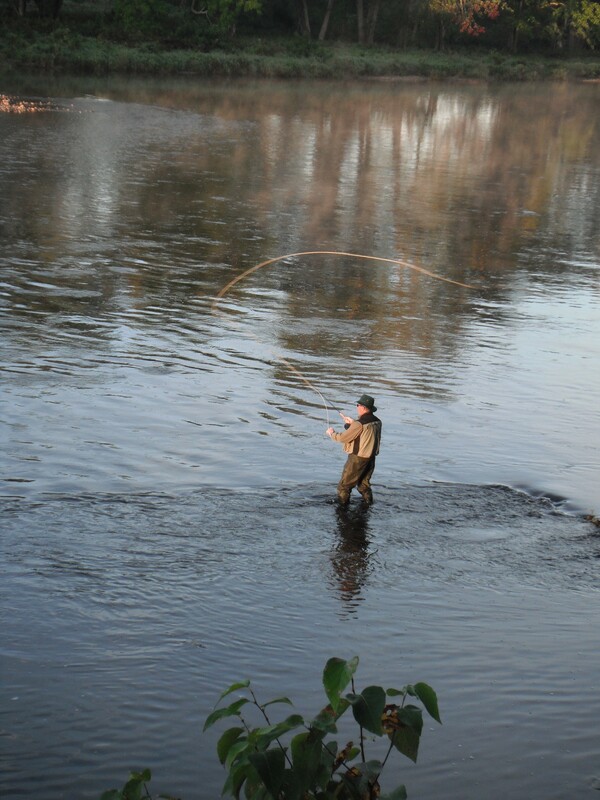 The trout darted out into the current and, as fast as he arrived, he left after spitting the small hook. Nevertheless this encounter renewed our hopes of taking a fish home and gave us the stamina to push the thoughts of bacon and eggs out of our heads for a few more casts. Have you checked your leader for knots lately, Dad? 5 weight, no big deal. Is that a bear? No it’s just my shadow. The Chase men in their Tilly Hats.